« How YOU can stop voter fraud in NC . . . today! (Raleigh, NC)-APR 23, 2013-Lou Stannard was steaming mad and who could blame him? He had just finished up a gig as a volunteer Election Observer and was furious as he watched voter fraud, over and over, right before his eyes . . . and nobody could do anything about it, without breaking our state’s protective election laws. At an historic April 10, 2013 Legislative public hearing on election law, Lou described how people entered the Precinct and couldn’t recall their addresses without reading from a freshly printed “voter ID card.” These so-called cards were actually full-sized pieces of paper that looked like freshly printed utility bills, which is adequate “voter ID” under our state’s current fraud-friendly election laws. 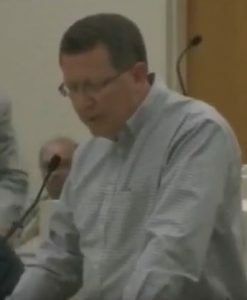 Click image to see Larry Henson’s Legislative testimony. I later caught up with Larry to get more details. The lady had a very unique facial birthmark, so there was no disputing her identity. The Judge quietly told her to leave, but took no further action. A few moments later, two angry election observers (one from the NAACP and the other from the United Nations) came storming back into the facility with her and accused Larry of “denying her right to vote.” Larry pointed at the Judge and asked, who was she trying to vote for? The Judge admitted that it was for her neighbor and the two observers slinked away. The woman kept yelling as she left, and Larry said there is no doubt that every voter in that room thought the lady was denied “her” right to vote and they will all have stories to tell their grand kids about voter suppression. The Legislature didn’t seem to care about Larry’s story. Larry didn’t say this at the hearing, but told me in a phone interview that he later overheard three other people standing in front of him who had just finished voting in the manner that Lou described. One of them then asked their accomplice, “were to now?’ And he named another Early Voting location as they departed. Click image to see Mrs. Brown’s jaw-dropping Legislative testimony. 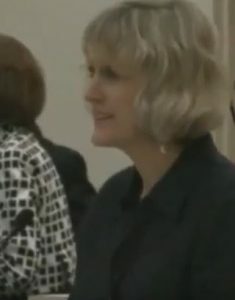 One more last witness I need to highlight from the April 10 hearing was Alexandra Brown, a former school teacher who cited her three children and her “wonderful husband” as the reason she was speaking at the hearing. She became disturbed as she noticed, “so many people were coming in who were having trouble recalling their address and it made me really start to wonder.” Later, as she stood near the same-day registration table, an elderly lady approached Mrs Brown and, “asked me if she had to register in every county they went to. . . . In my heart, I wrote in my notebook, I don’t know why I bother to vote. What is going on here? I just didn’t realize the corruption that I felt I was seeing and I wondered if I should even bother to vote or do anything at all.” The Legislature didn’t seem to notice her testimony and their transcripts are still unavailable. The problem is that in their haste, our Legislative Leadership seems to be ignoring testimony like the ones you’ve just read while they worked a quiet backroom deal with the Justice Department to push through a “voter ID” law that will do nothing to prevent those types of systematic fraud, beyond upgrading the quality of fake “ID cards” from a fake utility bill to a fake plastic ID card. Nobody will question those fake IDs, so nothing will change. Our “leaders” are ignoring those witnesses as they settle for a compromise in order to avoid a legal battle with either the Department of Justice or a shadowy group called “Blueprint NC.” They should table the Voter ID bill and hold hearings to bring light to the threat (or even reality) of election fraud BEFORE they enact this or any other election laws. The whole world needs to see the accounts of eyewitnesses who understand what they were seeing. During most other Legislative hearings on this important bill, the Election Committee heard testimony from reliable Blueprint NC supporters like NAACP and Democracy NC but the Committee didn’t have the stomach to invite people who had actually witnessed systematic election fraud. They eventually caved to their own grass-roots supporters to hold one last hearing on April 10th and something miraculous happened. Normally, the Blueprint crowd fills rented buses to pack the hearing room before most others can get off from work. Then, people like the above three witnesses sign up to speak, but grow tired and discouraged while waiting behind the bused-in witnesses. After enduring rant after rant from angry Leftist speakers, they finally just give up and go home. April 10 was different, because the rent-a-mob didn’t show up. Instead, real people drove in from Wilmington, Wilson, Roanoke Rapids and beyond to tell their personal stories. Some just read canned speeches that VIP-NC produced, but others told astonishing stories of first-hand observations. The Raleigh media ignored their stories, but we didn’t. Now, it will all be for nothing if the Legislature avoids even considering the possibility of systematic voter fraud in North Carolina as they rush for a solution. Again, beyond raising the cost of a fake ID from a nickel to a dollar, the “voter ID” law the Legislature is enacting will do nothing to hinder systematic voter fraud cases like the ones you’ve just read about. In the mean time, our friends in California warn us of a bleak future, which is their present-day nightmare: Nobody knows who is voting, but every referendum to increase taxes (and their government’s reach) is being approved by overwhelming majorities. And just like in some third-world nations, Linda Paine told us their California Election Integrity Project volunteers actually saw ballot boxes being stuffed in the parking lots outside of some polling stations. . . but they were powerless to stop it. Legend has it that North Carolina earned the “Tarheel” moniker after our state’s Civil War soldiers courageously refused to back down from a fight for their survival. We need our “leaders” to take a similar stand against election fraud. The days of pretending are over. There really is voter fraud in North Carolina and their job is to fix it . . . NOW!